has won an order for another drag chain conveyor, type LOUISE TKF. The shock-pressure-proof design of its predecessor was no longer required for the new model because of the change in classification of the plant segment. The dispatch of the machine is planned for June 2017. CSBM, Companhia Siderurgica Belgo Mineira. Arcelor was created by the merger of Aceralia and Usinor and merged with Mittal in 2006 to become ArcelorMittal, the world’s leading steel concern. Around 15 years ago, AUMUND Fo¨rdertechnik GmbH integrated the products of the LOUISE subsidiary into its own portfolio. This double-strand drag chain conveyor with a capacity of 3kW, a centre distance of 10.4m and a performance of 25tph (tonnes per hour), will be used for bunker extraction. The previous machine proved its durability in an interesting way. One of the supports of a weighing cell collapsed and caused one side of the silo to subside. A large portion of the fallen steelwork weighing several tonnes was resting on the discharge conveyor. If it had not been for the strength of this machine, the silo may well have collapsed completely, and the damage would have been far more extensive. “It is of course not the usual method by which we test the quality of our machines!” remarks Ingo Dietzold, Managing Director of AUMUND do Brasil in Sa~o Paulo. 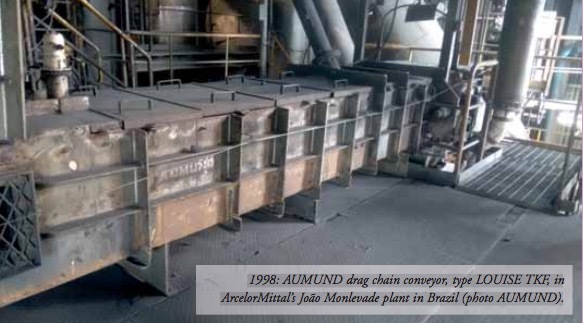 ArcelorMittal Brazil boasts 11,000 employees spread over 27 manufacturing and administration sites, and has a production capacity of 11.3mt (million tonnes) of steel and 7.1mt of iron ore. The AUMUND Group is active worldwide. The conveying and storage specialist has special expertise at its disposal when dealing with bulk materials. With their high degree of individuality, both its technically sophisticated as well as innovative products have contributed to the AUMUND Group today being a major force in many areas of conveying and storage technology. The manufacturing companies AUMUND Fo¨rdertechnik GmbH (Rheinberg, Germany), SCHADE Lagertechnik GmbH (Gelsenkirchen, Germany), SAMSON Materials Handling Ltd. (Ely, England), as well as AUMUND Logistic GmbH (Rheinberg, Germany) are consolidated under the umbrella of the AUMUND Group. In conjunction with the headquarters of the manufacturing companies, the global conveying and storage technology business is spearheaded through a total of ten locations in Asia, Europe, North and South America and a total of five warehouses in Germany, USA, Brazil, Hong Kong and Saudi Arabia.